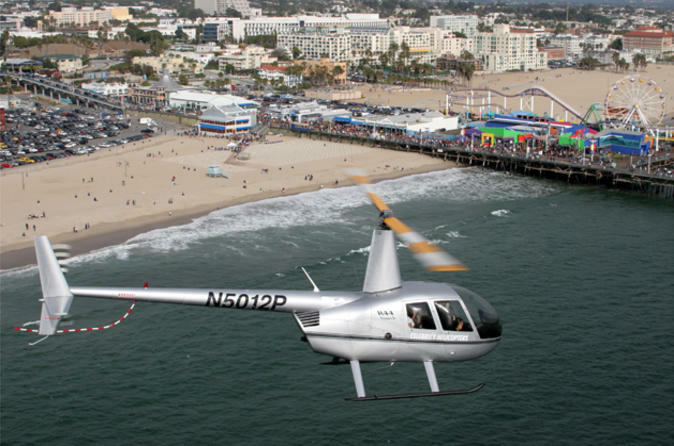 Admire the LA area's beautiful coastal cities, beaches, harbors, cliffs and hills on this 25-minute flight. Pass over Long Beach, Manhattan Beach, Hermosa Beach, Palos Verdes, Cabrillo Beach and other elegant beachside communities, and get great aerial views of the RMSQueen Mary and the Port of Los Angeles' cruise ships and container ships returning from abroad. This particular tour focuses on the "South Bay" or rather the "Peninsula" of Los Angeles, a hidden gem and definitely a destination not many tourists get to see while visiting. See the beach cities and some of the most amazing homes that sit on the cliffs. Also see the beautiful green landscapes of Rolling Hills as the backdrop to LA's Harbor, one of the most important staples to the livelihood of all of Los Angeles. See the shipping containers from the sky, the logistics industry, the beauty of Long Beach's harbor, the new beachfront condos being developed, the cruise ships returning from the Mexican Riviera, the historic Queen Mary and much much more. This is a flight you will definitely remember, especially if you're not from LA... your perception will change after seeing what is called "The South Bay". It's time to take in the wonderful smell of the sea breeze from the sky. Upgrade your flight package, and see Los Angeles "Hollywood" style. Live the life and add all the comforts of a true celebrity to your flight. Starting with champagne, hors d'oeuvers, a unique souvenir t-shirt, framed photograph to help you cherish this memory of a lifetime.